Are You Remodeling? Think Green! Recycled glass countertops are a colorful way to help the environment. Remodeling might best be described as a few weeks of chaos that are well worth the stunning results. But even though you are likely to endure dust and clutter during your remodel, that doesn’t mean you can’t embrace some aspects of environmentally friendly planning and construction. Perhaps the easiest way to go green is with environmentally friendly house plans through your paint choice. At Tracy Lynn Studio, our San Diego interior designers prefer the Dunn Edwards brand of paint, which includes options for zero VOC (chemicals). However, also be aware that all of Dunn Edwards paints are labeled “zero toxic.” Many other paint manufacturers still use ethylene glycol, a toxic compound. A second way to keep the environment in mind as you remodel is to use recycled materials. 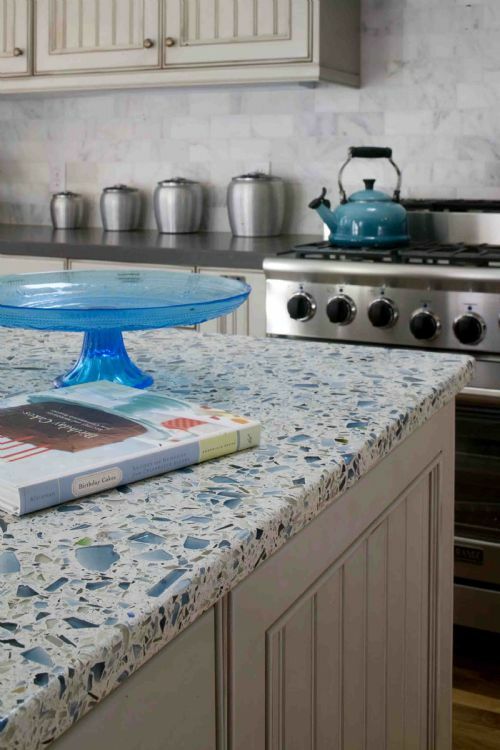 For example, many manufacturers offer recycled glass transformed into countertops, vanity tops, bar tops and fireplace surrounds. Reclaimed wood—such as from barns, old mantels or timbers—can become a beautiful feature in your home. Oftentimes remodels include removal of operable fixtures such as tubs and sinks, and construction materials such as doors, windows, tiles and plumbing. Wouldn’t it be nice to be able to donate those items to people who can use them? Well, you can. Habitat for Humanity operates a chain of shops across the country called ReStore that accept donated items for resale. Fortunately we have a ReStore in San Diego, just east of Qualcomm Stadium. For more information, click here. Finally, I just wanted to mention that being environmentally conscious also means thinking ahead to how we can use fewer resources. Although it is costly, a system such as Crestron offers you automation of all your home’s lighting, heating and air conditioning and audio-visual components. 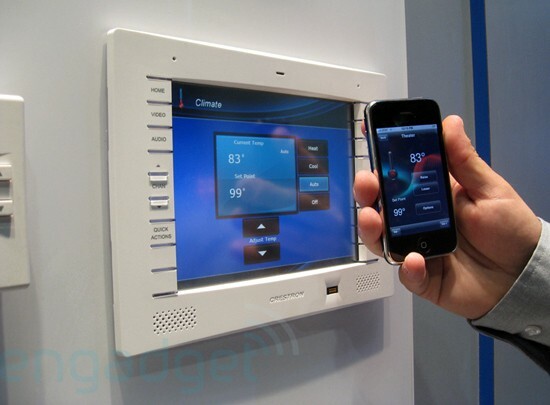 An integrated system such as this allows you to control your energy consumption. Plus you can even operate it from your smartphone – wouldn’t it be nice to come home to a cool (or warm) house with soothing music playing in the background? 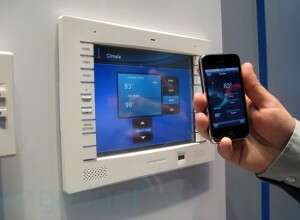 A Crestron system allows you to operate your home’s heat and air from your smartphone. 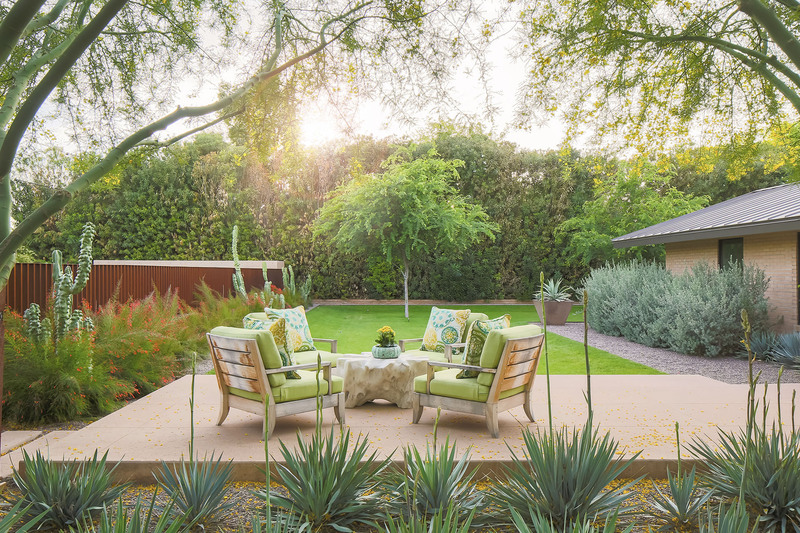 Please contact our San Diego design firm if we can help in showing you how to remodel your home in an environmentally friendly way, or with any of your design needs.